When you want to change your organisation’s IT infrastructure, where do you start? How do you find the right partner who can provide strategic advice, technical expertise and a “trusted pair of hands”? Fordway has over 25 years’ experience helping organisations make their IT infrastructure work. We believe every element should be as resource efficient as possible, from using less hardware or consuming less power to optimising software licences. We help organisations use IT to support change and achieve significant business benefits. If you’re happy with the status quo, you don’t need Fordway. However, if you want to use IT to take your organisation to the next level, talk to us. We’ll ask difficult questions and challenge assumptions. We won’t give you the ‘same old stuff’ or the easiest solution; instead we’ll work with you to find the optimum solution for your organisation. “Fordway offer the assurance of having experience available in depth but that does not mean we see different faces each time we work together. Fordway place value on continuity and the manner in which people with new skill sets have been introduced to us by colleagues with whom we have worked with previously builds confidence and avoids the pain of having to start from square one every time we embark on something new. Roger Bearpark – Assistant Head of IT, London Borough of Hillingdon. 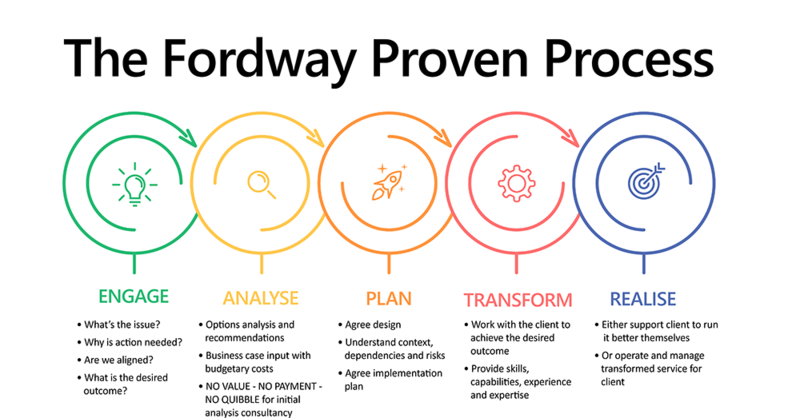 Our customers tell us that they choose Fordway because we offer a unique combination of in-depth technical expertise and practical implementation experience. Our mature, experienced team work seamlessly alongside you to deliver the project on time and on budget. Our technical staff hold qualifications from all the leading vendors, including Citrix Dell, HP, Microsoft and VMware. “The key thing with Fordway is that the depth of knowledge of their staff. I didn’t have to pay for a full-time SAN or Citrix expert as their staff had all the skills we needed. They were effectively an extension of our IT department – whatever I didn’t know, they did.” Stuart Gale, Global IT Services Manager, Intelligent Energy. “Fordway’s technical capabilities and experience made them the ideal partner for this project. We worked closely together at every stage – we disclosed everything and they responded with an open door policy, answering questions as they arose and giving advice to help our staff learn the new system. They really went the extra mile in sharing information with us at every stage, enabling our staff to gain hands-on experience working alongside them.” Mark Pitkin, Project Manager in the ICT Strategy and Programme Group for Warwickshire County Council. Fordway was established in 1991 by our current Managing Director Richard Blanford and has grown consistently and organically over 25 years without external financial investment or support. We own our head office in Surrey, where our Service Desk is located, and our own equipment in two UK data centres, providing our cloud and managed services. As a vendor independent organisation, we find the best solution for each customer and tackle the root cause of infrastructure problems, rather than just treating the symptoms with new hardware and software. We begin by understanding business objectives and then use best practice processes, technologies and security standards to design a tailored solution , reusing existing products as much as possible. “We liked the fact that Fordway weren’t prescriptive – they tailored their implementation to our requirements. We didn’t want to go through a proof of concept stage, but to move immediately to a live environment. Fordway’s experience meant they could do this, and their attitude was: ‘we’ll work together to solve any problems that occur.” Darren Stone, IT Manager, West Yorkshire Fire & Rescue. We hold ISO9001, ISO14001 and ISO27001 certifications. Fordway is an approved G-Cloud supplier and all our cloud solutions are available through the Government’s CloudStore. Our projects were winners at the 2010, 2011, 2012 and 2013 Green IT Awards, demonstrating the environmental benefits delivered for clients the London Borough of Hillingdon, Intelligent Energy, the London Borough of Brent and Team BFK (BAM Nuttall, Ferrovial and Kier Construction Ltd., a consortium delivering part of the Crossrail infrastructure). We care passionately about what we do – every customer really matters to us, and we’re committed to providing a first class service, whatever the size of the project. Our priority is to ensure each project is implemented effectively on time and on budget, and we’ll always go the extra mile to deliver on our promises. If circumstances change during the project, we’ll work with you to find a solution. This is how our customers describe our approach. “From day one Fordway have been positive, listened to our ideas and been able to adapt to our way of working. They’ve been remarkably flexible despite everything we’ve thrown at them! We’ve had a lot of last minute changes in demand, but their onsite and back-up teams have approached these requests as a challenge and simply got on with finding a solution.” Geoff Bull, BFK Quality Manager. “They have been incredibly flexible to our needs and been able to react quickly to meet the rigorous demands of this project. Their advice and guidance will leave us with an infrastructure that we can be proud of.” Richard Chalkley, Programme Manager, Greater East Midlands Commissioning Support Unit (GEM).